Not many companies can match the years of experience, stability and integrity that Brush HIll Tours/Gray Line of Boston offers. The Anzuoni family has been at the forefront of the transportation business since 1920 when George A. Anzuoni, Sr. founded Service Bus Lines. 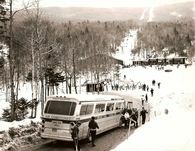 Service Bus was the first motorcoach company to use rubber tired, non-rail vehicles on the eastern seaboard. 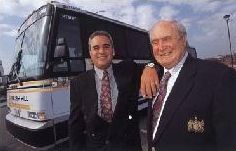 George A. Anzuoni, Sr. acquired Brush Hill Transportation Company in 1954 and designated his son “Larry A. Anzuoni, Sr.,” to take control of the bankrupted commuter line. At the time, the company offered transportation to those employed by the large estates on Brush Hill Road in Milton, Massachusetts. 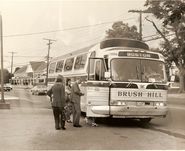 The Brush Hill Transportation also provided transit service on two commuter lines. As the company began to grow, Anzuoni continued to pursue new avenues of service and astutely assessed the growing needs of the public. The time had arrived to acquire modern equipment in order to compete with some of the larger motorcoach companies doing business in the area. Brush Hill’s charter business began to grow and soon provided service to many prominent businesses, schools, senior recreation departments and individual clients on board. 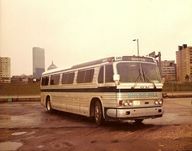 In 1981, Brush Hill Tours obtained a sightseeing license in Boston that opened the door for new opportunities in the revived tourism and convention marketplace. 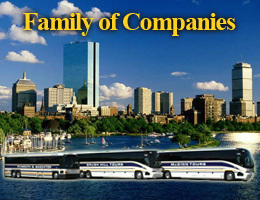 In the early 1990s, the Gray Line Sightseeing Franchise or ‘diamond’ for the Boston and Cape Cod area was awarded to Brush Hill Tours. Gray Line is a 102 year old worldwide sightseeing organization; “Truly The Local Experts” in well over 700 Gray Line destinations around the globe. Brush Hill Tours offers a full schedule of one-day Boston and New England tours, as well as the Beantown Trolley shuttle, a San Francisco style trackless trolley car, with a fully narrated 105 minute tour of Boston and point to point shuttle service along the tour route. Educational programs, ski trips, senior trips and charters of all kinds to destinations all over the United States, Canada and Mexico are available to your groups. Our company has provided employee shuttle programs for corporations such as Morse Shoe, The Kendall Company and the Putnam Company. We have been the primary transportation company for many prominent meeting planners, corporations and convention groups as well as professional and collegiate sports teams. Brush Hill Transportation is centrally located just south of Boston proper on a six-acre property comprised of 36,000 square feet of maintenance and administrative buildings. Within these buildings our operations department, training room, driver’s area and indoor parking are located. Next to the maintenance facility is our 6,000 square foot administrative headquarters. Our facility is one of the most completely equipped garages in the area, capable of performing all the duties of operations, service and maintenance. Our expert maintenance staff is readily available to avoid a suspension of service when repairs are necessary. Should there be a problem on the road, we have our own service truck and mechanic as well as an extensive network of companies that can provide emergency services, if necessary. We also have the resources of our two sister companies, Plymouth & Brockton Street Railway Co. and McGinn Bus Co.
Brush Hill Transportation is conveniently located just two miles from Braintree, Massachusetts, less than a mile from Route 128 and within minutes of Route 28, 95, 24, 495 and 3. The key to your successful charter or tour starts with safe equipment and safe drivers. Your safety and enjoyment is Brush Hill’s number one priority. We employ a safety officer with over 25 years with the company as a driver, dispatcher and trainer. Dispatchers are on the property 22 hours a day, seven days a week and as long as a vehicle is out on a trip. All drivers have cell phones with them for emergencies.